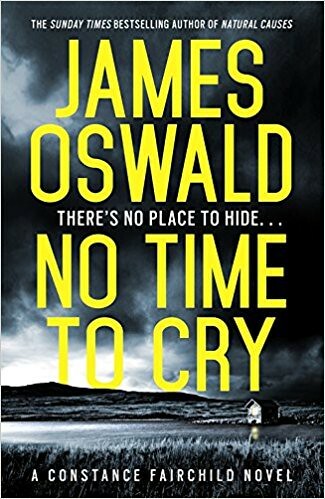 No Time to Cry is James Oswald’s new crime series. It’s so good that I raced through a lot of it, and rested a little here and there, because it got so scary/exciting that I needed to let my nerves ping back to neutral again. 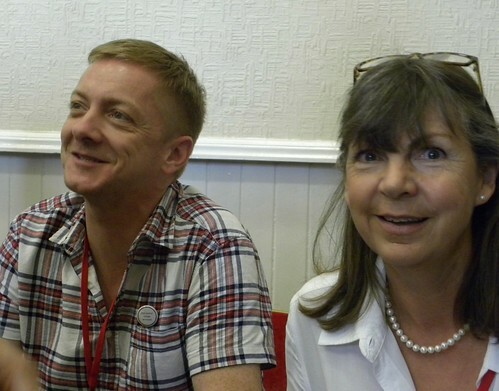 James has a female detective this time, but apart from the swearing Constance Fairchild does – mainly to fit in – she’s quite close to Tony McLean in her social background, by which I mean she’s [originally] well connected, except she doesn’t get on with her immediate family. No Time to Cry starts with Con walking in on the murder scene of her boss Pete. Before long she’s accused of killing him and suspended from the London Met. She obviously needs something to do, so apart from trying to stay alive when different people take turns attempting to murder her, Con starts digging into the disappearance of a childhood friend. Before long it seems that nothing she does is terribly safe, and I began worrying about the various older females near her, and an unexpected cat, hoping there was to be no more Mrs McCutcheon-ing, with or without cat. Great crime thriller, complete with a character from the Tony McLean books. I look forward to seeing what will happen next. 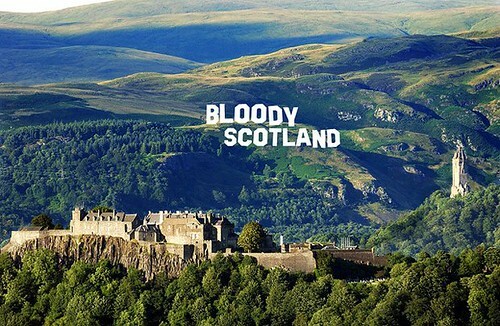 If you thought that rubbing shoulders with crime writers at the Coo in Stirling, during the Bloody Scotland weekend in late September, sounds like fun, you can forget it. The event sold out in no time at all. But there’s other daft stuff you could do, unless you delay so that these other events also sell out. Personally I fear this might happen more than I’d find convenient. You know, I don’t want to commit just yet. But I don’t want to be left without, either. There’s more than one event where crime writers do something else, like sing. Or pretend to be a television quiz show. There is even a musical, written by Sophie Hannah and Annette Armitage, which to begin with I believed to last seven and a half hours, but it’s just two ‘sittings’ so to speak. Or there’s the cast and crew of Agatha Raisin. You can go to the football. I haven’t yet, but there is no saying how long I can hold out. 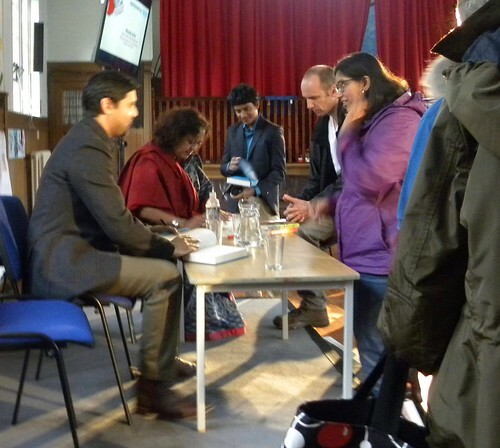 If you fancy more ‘ordinary’ events where authors talk about their books, look no further. Bloody Scotland has a lot of them. I see James Oswald has a new detective. (I don’t like change!) There’s an event on breaking barriers with three Asian authors and one Icelandic one. Or there are more Icelanders in a separate event, if you prefer. They have Swedes. Well, they have one real Swede, Christoffer Carlsson, from my neck of woods. He’s nice. Although not so sure about his murders. Then there is a French fake Swede, but who writes about Falkenberg, which I highly approve of. And someone else foreign who at least lives in Sweden. It’s 2018, so violence against women has to be addressed. Our favourite pathologist is coming back. So is Pitch Perfect, where they let the hopefuls in. The Kiwis are coming, and Chris Brookmyre has got a new name as he writes with his wife. They also offer some of the biggest names in the business, but you’ll need to read the rest of the programme yourselves. 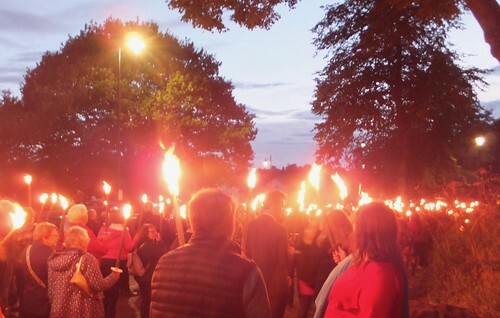 And come and see the torchlit procession on the Friday night! They all seemed to be women. 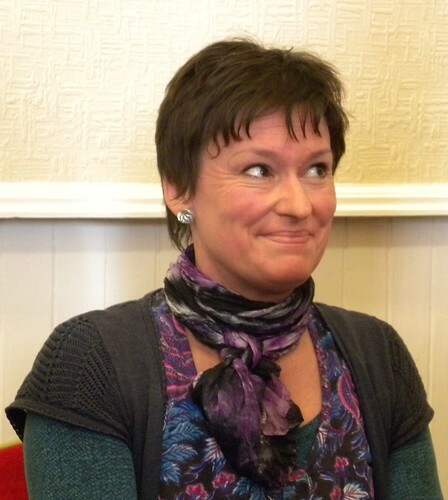 Or perhaps I merely happened to choose Book Week Scotland events that featured women. I picked what interested me, and what was nearby enough to be doable, and at times convenient to me. Four events, though, and a total of nine women speaking at them. Only the last one, about gender violence, had a subject that determined who was likely to be taking part. The audiences were slightly different. For Mary Queen of Scots there were three men. The gender violence had one man in the audience for part of it, one man to operate Skype (!) and one man who seemed to be working in the room where we sat. 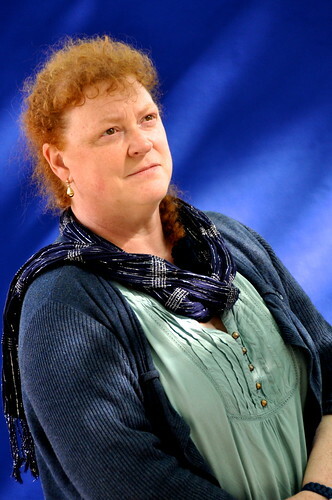 Several men for both Lin Anderson and the autism discussion, while still being in a minority. Three events were during daytime, but that doesn’t explain the lack of men, when the women were mostly well past 70. Starting on Monday, 27th November, is this year’s Book Week Scotland. And there is much you can do. But don’t delay. There is no point in me suggesting you catch James Oswald in Auchterarder, because he’s already sold out. And because I have now more or less decided what I will and won’t do, I have stopped looking at the ticket booking facility, so won’t know what else might be too late. Crawford Logan, aka Paul Temple, will do an event in what seems to be an undertaker’s ‘service room.’ But I don’t see why not. After all, he was last seen by the Bookwitch family doing a reading at the Grandmother’s funeral. He knows what to do. A place and time that is surprisingly good for me is Rachael Lucas talking about Asperger’s at Waterstones on Monday night. And more locally, I have Alex Nye coming to my nearest library (not that I’ve measured), and Alexandra Sokoloff will be talking at Stirling University. Lin Anderson will be in Alloa, and Badger (the lovely dog) is coming to Cumbernauld. And I could go on. But I won’t, because if I mention all the people I would like to see but can’t, because they are booked to speak in Shetland or (almost as bad) Orkney, I will get upset. But if you happen to be close to my far flung places, then off you go to a lovely event or two. Julie Bertagna, for instance. Or Debi Gliori. As has become clear over the Bloody Scotland weekend, there are series everywhere. Not only do the long – and medium – established writers have series. The debut authors are also planning several books. Even the unpublished ones pitching their first novel, spoke of series. If you are free to read whatever you like, whenever you can, with no blog commitments, you can probably keep up with lots of series. I no longer know what to do. I tend to wait and see what happens. Because I can’t actually make the decision. It has to be made for me. I will – temporarily – abandon a series of books I love, if there is something else, equally loveable out there. Maybe something that is noisier when looking for attention. And that first abandoning was never intentional. It just happened. It’s not you; it’s me. In the last maybe fifteen years I have read and thoroughly enjoyed the crime novels by Kate Ellis and Stephen Booth. I read every one up to a certain point. I read about Mma Ramotswe. I read these usually in the right order, moving backwards to catch the odd earlier book, and then waited in real time for the next one to be published. It seemed like a long wait, until it wasn’t so bad, and then until the next two books were here and I didn’t know how to fit them in. I discovered Sara Paretsky, whose books I still read when a new one comes along, and slowly reading the older ones. Among my new people, as you know, are James Oswald and Vaseem Khan. I don’t know how long I can keep going. I want to. But I wanted to with the others as well. With Sophie Hannah I grew too scared to continue, so that was an easier decison to make. And thankfully we have the new Poirots. Or there is Harry Potter, but we knew how many books to expect. Knew there would be an end. As we did with Skulduggery Pleasant, at least until Derek Landy decided to keep going a bit longer. With Lockwood you might not have known for certain, but unless something changed, the characters would eventually be unable to do what they did because of their [lack of] years. Which books do you keep? Will I ever reread the abandoned series? Will I restart one day? Which ones will I regret once I have ditched my copies? When we moved, we parted with about half our Dorothy Sayers. That seemed OK. Many of Agatha Christie’s books I’ve never owned as I borrowed them from the library. And then I looked at my shelves for inspiration, and considered Margery Allingham and Ngaio Marsh. Those books I read slowly over a long time, and I don’t claim to have read all. But the thought that I might get rid of the books made me want to cry. They are staying. Campion is like a crazy older brother, and Alleyn some benevolent uncle. Yes, I know I have now bypassed them in age, as far as most of the stories are concerned. So what to do about those just starting out? Not read at all, just in case? Read one and be hooked? Have nervous breakdown? 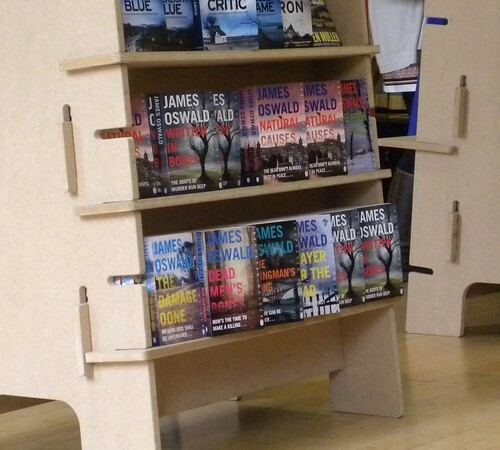 Yes, I am aware I made this year’s Bloody Scotland the beginners’ festival, but James Oswald is my new crime writer. When he turned up four years ago to take the place of Eoin Colfer, I was disappointed, but only for about three minutes. And anyone who can, if not exactly replace our favourite Irishman, be just as good but in a different way is, well, good. Yes, I know I just said that. Besides James was given the extra handicap of having to read after Colin Bateman. And he survived! 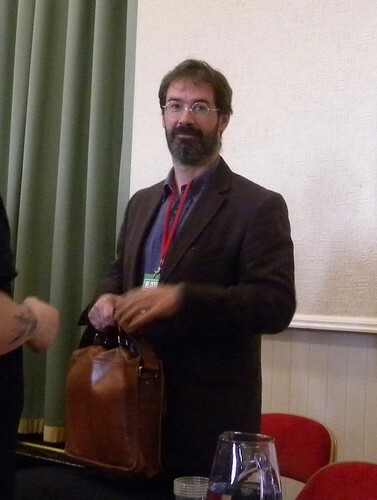 After a few years of coming back to Stirling, and being part of panels of three or four, here he was, practically on his own, and in a full Albert Halls at that. 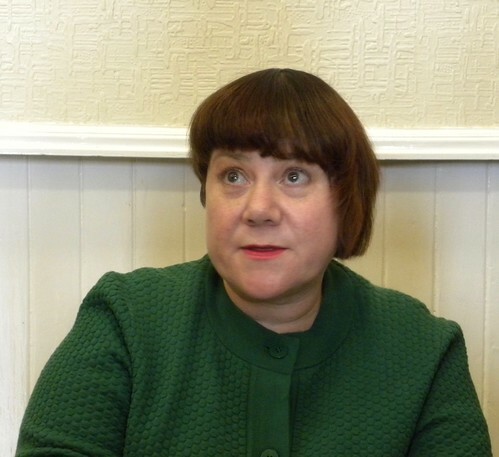 Yes, I know he appeared with Sue Black, the famous forensic anthropologist dame, but I usually think of her as being paired with Val McDermid, so this was definitely a step up, or two [for James]. And Lin Anderson was there to keep order as they talked corpses and what to do with them. Lin actually insinuated that we in the audience were somewhat suspect, as though we all had dead bodies we needed advice on disposing of. They spoke mostly about James’s latest Tony McLean novel, Written in Bones, and where he put his corpse and what could be done with it after. That’s up a tree in the Meadows (just outside Lin’s flat, I gather), and the trick is how you remove a body without it deteriorating or ending up all over people and roads and that kind of thing. James admitted that Tony McLean is a bit him. He has given Tony most of his own hang-ups. And he does actually own three Alfa Romeos, albeit only one that works and lives in the garage. The other two are in the cowshed. Despite making Tony’s grandmother such an integral part of the books, James never knew either of his; only his maternal grandfather. Sue said that her grandmother was her best friend, and talked about how tough it was for her teenage self to discover that her grandmother’s sixty-a-day habit was about to kill her. ‘Oh, she was a wicked woman!’ Sue said about her best friend. It seems her grandmother consoled her by explaining that she’d never leave her; that she would be sitting on her left shoulder, where ‘that bloody woman’ has witnessed all that Sue has done. If you’re wondering, the right shoulder’s for the angel. Sue didn’t enjoy counting dead fruit flies at university, so switched courses at some point. She also had a gruesome tale about a barbecue where you first had to choose your meat, while it was still a living animal… It could be that Sue really doesn’t know what to do when she grows up, but meanwhile she is Professor at the University of Dundee, where she raised half of the two million pounds needed for a new, bigger and better mortuary. Talking about the bodies donated for research, they have an annual memorial service for these people, because it’s important to remember who they were . On the other hand, Sue doesn’t approve of ‘body farms’ and after hearing what they do, neither do I. And because we are all experts now, after watching CSI, people like Sue can never hope to compete in court, so juries are less impressed. James said that on one occasion he made Tony travel outside Edinburgh, to victims discovered near James’s own farm, and when Tony needs to clear his head by going for a walk, he is chased by James’s highland cows. As for himself, he’s so shy he has never asked the police about procedure, afraid he’d be arrested if he did. For him the touchstone is whether what he’s writing is plausible, and he will rewrite if worried. His first bit of fan mail came from a retired policeman who was so impressed he wanted to know who his source was, because he could almost guess. On the subject of fan input, the most James has had is about Mrs McCutcheon’s cat. ‘Is it all right?’ ‘Don’t hurt it!’ Someone wanted a book about the cat, and James reckons he might manage a short story about Mrs McCutcheon’s cat. 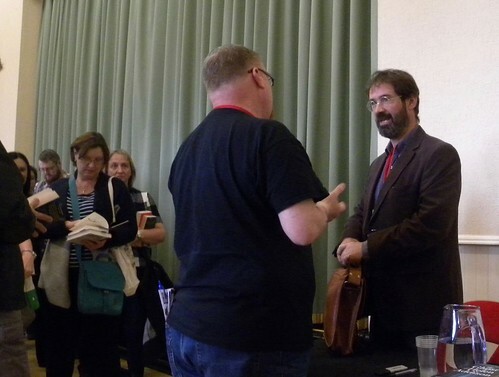 My theory is that if you tried to take photos of someone’s arm being waved in front of an author’s face, you’d not do well. Whereas if you aim for the opposite, there are an awful lot of available arms out there, as well as hands and stomachs and books. Another observation is that it helps trying to enter a Bloody Scotland venue through the correct door. That aside, Sunday was another good day. Well, I might have jinxed the weather somewhat by mentioning Saturday’s sunshine. It rained a wee bit on Sunday. But that’s fine. We are hardy souls. Was pleased to encounter Fledgling’s Claire Cain, and we compared notes on events seen. I decided I didn’t fancy Harlan Coben, and swapped the free book on my seat for Elizabeth Moon’s Winning Colours. Had another event in the church immediately after, so trooped out and queued with a couple of crime fans who had just been to hear Vince Cable, and who were very enthusiastic, except maybe not about his book selling out. Coincidentally it’s a crime novel, set partly in India. And they’d definitely vote for him. My second event was Pitch Perfect, and I spied a couple of people ‘in the business’ but don’t know if they were there for professional purposes or not. It’d be a good place to discover a new – and unadopted – book you like the sound of. As for me I was so carried away by it all that I – literally – forgot where I was. 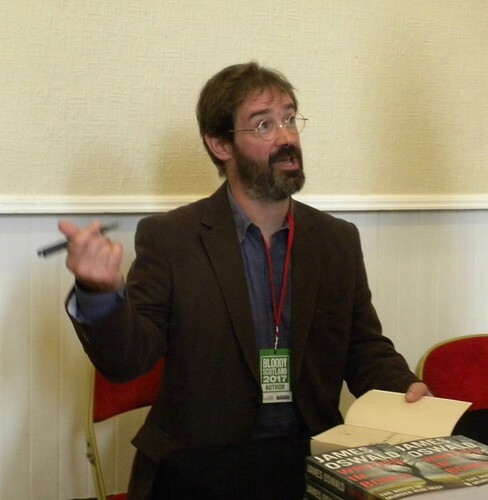 Then it was time to walk over to the Albert Halls, where I did a quick check for signing authors and found a panel of four, including three who had written a short story each for the Bloody Scotland anthology; Louise Welsh, E S Thomson and Doug Johnstone. Remembering I actually had my copy in my bag, I hot-footed over to the end of the queue, while mentally kicking myself for not collecting more signatures on Saturday. Virtually everyone is/was here. I told Doug how disturbing his story was, and he seemed really pleased. Went downstairs for James Oswald’s event, and looking around the free books, came to the conclusion that there are a lot of books by James Patterson in the world. In fairness, the James we came to see also has a few books out, and the shelves in the shop were satisfyingly full of his Tony McLean novels. Managed to avoid most of the unwanted arms and elbows when I took photos of James at his signing. Noted that he has adapted to signing sitting down. Some of us also found Lin Anderson resting after chairing his event, and I got myself another Bloody Scotland signature. I asked Lin if we might hope to see more of this kind of story collection, and if it’s down to her, we definitely will. Let’s hope it is then, because as she said, they only used up a dozen authors for this volume, and many more where they came from. It was time for me and my umbrella to walk home, and I did so musing on the mystery of Stuart Neville. I had kept noticing his photo in the programme, and every time I looked for his name, he wasn’t there. It wasn’t until I peered extra carefully at the photograph that I saw that it was him. Stuart was here as Haylen Beck, who has a ‘debut’ novel out. I should have trusted my instincts. There can’t be two authors who look like that.